Trying on a hat, Alison Roepe, Lawrence, shops on Black Friday at the Fair Trade Holiday Market at Ecumenical Christian Ministries, sponsored by the Lawrence Fair Trade Coalition. Shoppers found items at the market from all over the world. While thousands of early-morning shoppers waited in line outside big-box stores, other people chose an alternative approach to their Black Friday shopping. When: 8 a.m.-7 p.m. Saturday and Sunday; 11 a.m.-6 p.m. Monday through Thursday; and 8 a.m.-7 p.m. Dec. 3-5. Where: Ecumenical Christian Ministries, 1204 Oread Ave.
Friday kicked off the annual Fair Trade Holiday Market at Ecumenical Christian Ministries sponsored by the Lawrence Fair Trade Coalition. Roberta Renz was among shoppers who attended the market in search of fair trade Christmas gifts. “I know the people who make them are getting a fair price for their work, I know they are unique and high-quality items, and I know they are made in a way that isn’t harmful to the earth,” Renz said. The market includes handcrafted sculptures, jewelry, textiles, dolls and decor, along with teas, chocolates and coffee from 35 countries. The products come from fair trade cooperatives such as Equal Exchange, Ten Thousand Villages and Women’s Bean Project that often choose to devote some of their profits to community development projects including schools, hospitals and other infrastructure improvements. Don Raybern, a volunteer at the event, said shoppers are doing more than supporting fair trade. Brady Swenson, member of the Lawrence Fair Trade Coalition, said the unique gifts come with interesting stories. 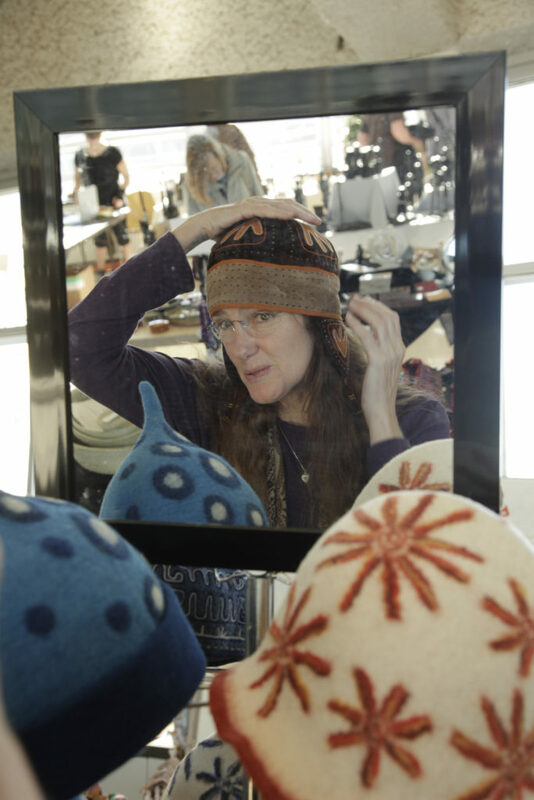 “It’s not only a gift to whoever you’re buying it for, but a gift to the artisan who made it as well,” Swenson said.